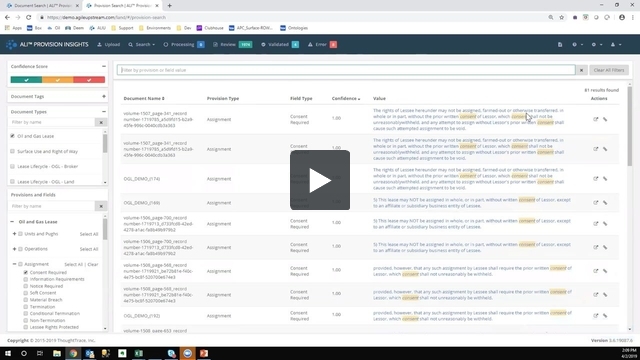 Watch the latest ThoughtTrace webinar to learn how to use the new ALI Faceted Provision Search with document tags - the new, powerful feature combination helping users gain even more efficiency in their contract analytics platform. ALI Faceted Provision Search gives you a simple search interface to quickly return a list of provisions and provision details faster than ever before, especially now that you can use Provision Search in conjunction with document tags. Imagine you’re in a divestiture planning meeting and someone poses a question about how a certain provision will impact moving the deal forward. and now with Provision Search + Tags you have that information at your fingers tips and can answer the question during the meeting while you still have everyone in the room. Game changer! The next webinar will be held on April 11, 2019 on "Applying Contract Analytics to Manage Offset Language in Greater Detail: A Response to the Recent Texas Supreme Court Ruling." Register here!